I love that building, said my friend John, a publisher with a reliably elegant sense of taste. It was designed by Louis Kahn. The Yale Center for British Art, in New Haven, Connecticut, is housed in a sleek shell of matte steel on Chapel Street, the bustling main drag of the town. It was the architect’s last major commission, completed after his death in 1974. It’s an interestingly modern container for the almost exclusively older works of art within, lovely canvases of fetching ladies, bewigged lords, and big-eyed colonial children with their colonial pets. 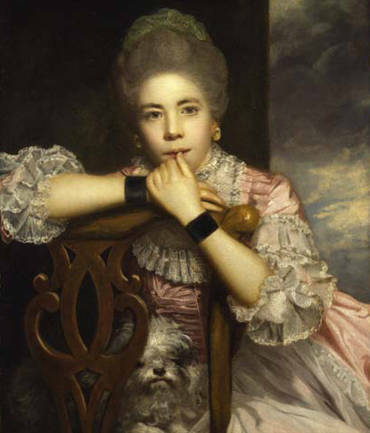 Mrs. Abington as Miss Prue in Congreve’s Love for Love, completed by Sir Joshua Reynolds in 1771, is a good example. You’ll also find lots of animals, horses and dogs mainly. My old friend Betsy, who lives nearby, told me she has spent serious time sunk in an overstuffed leather chair in the high-ceilinged gallery admiring the zebra painting. 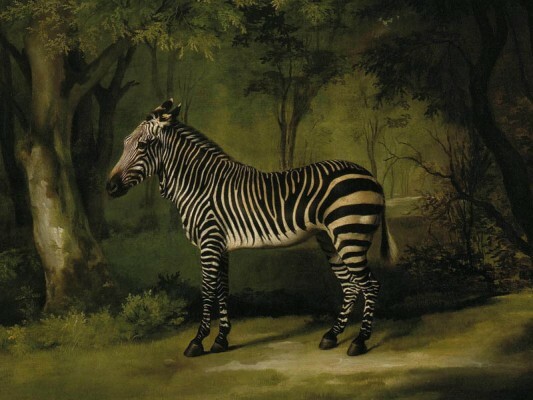 A rather famous zebra painting, made by George Stubbs in 1763, when a zebra would have seemed about as exotic to Europeans as a unicorn. We couldn’t help but be stopped just inside the glass doors as we were coming in by a much more modern work. What is that? I said to Wendy, puzzling it out. A minotaur? A centaur? No, she corrected me, a centaur is a man on top, horse on the bottom. This was a horse on top. I liked it a lot, it was so rough and raw, like something you’d see in a dream. 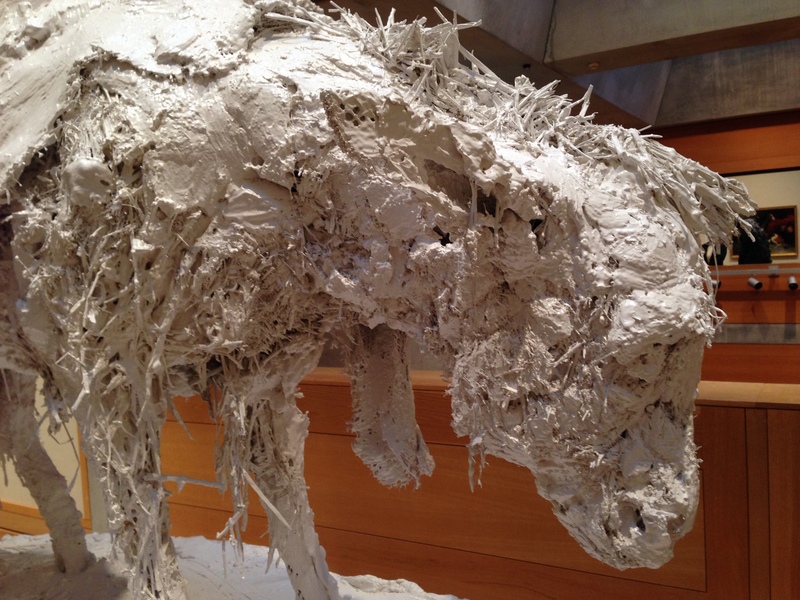 Turned out that Foal, sculpted of painted bronze, was one of seven works by the British artist Nicola Hicks which had been installed as a special exhibit in the Yale Center. The mythic is central to her work. As part of the show Hicks selected pieces from the museum’s collection to serve as counterpoints to her own. The British tradition of animal imagery intertwined with the contemporary creatures in a dynamic, charged way. 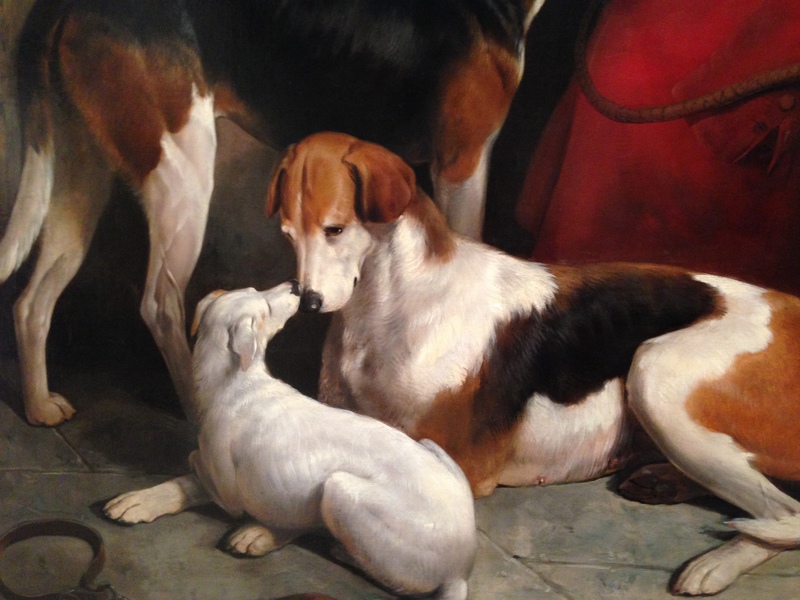 The painting chosen for the display that I found most affecting was William Barraud’s A Couple of Foxhounds with a Terrier, the Property of Lord Henry Bentinck. Hicks has said she recognizes Baraud’s profound understanding of how the “social structure” unites the animals depicted. It’s about the independent dogness of dogs, despite the humans that may believe they own them lock stock and kibble. One sculpture reflected on Aesop’s fable about a donkey found in the forest wearing a lion’s skin, which ultimately results in the donkey being exposed as a fool. 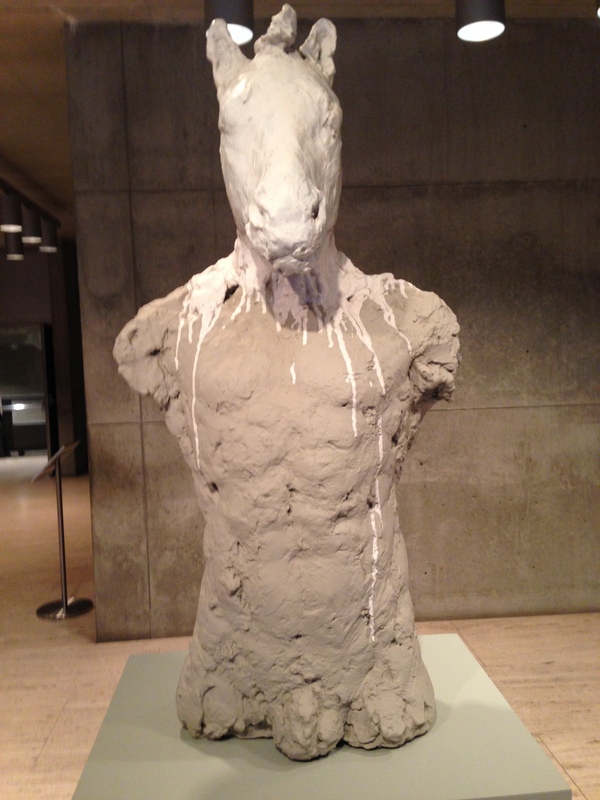 Nicks’ Who was I Kidding, created of plaster and straw, shows the poor donkey with the skin thrown across its back. 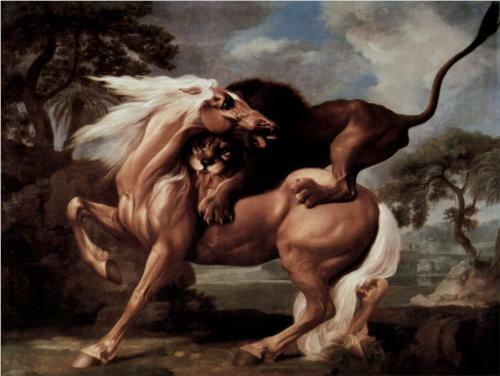 It bears some resemblance to another Stubbs canvas in the museum, A Lion Attacking a Horse. The horse in that conception feels not shame but blind fury. Later, over tea, I noticed that Wendy had bought a postcard at the gift shop. 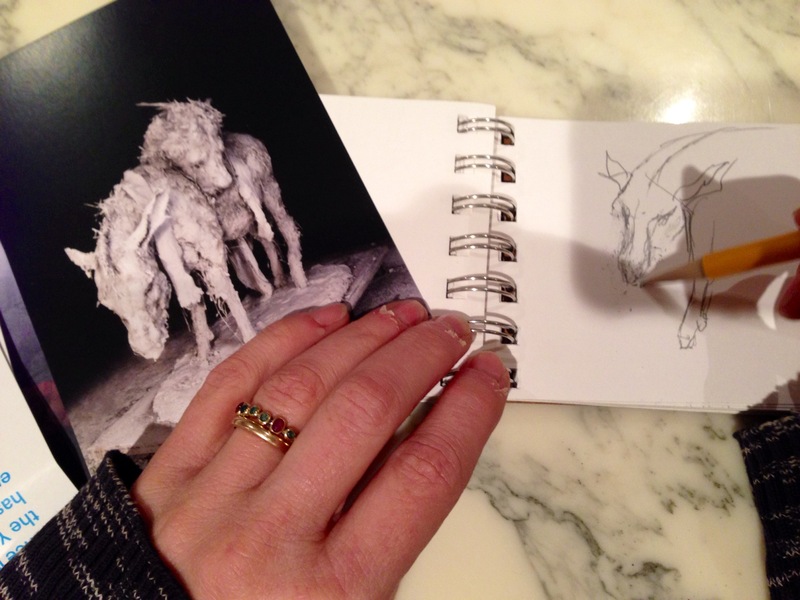 She had out her small, purse-size sketchbook and a pencil. Wendy’s a musician, an actress, an astute psychotherapist. She was drawing the donkey, tracing the gentle lines of its hanging, shamed head. She had taken the experience with her, as we do all myths that have power. No one I’d rather drift around a museum with.